Generally we feature nonfiction books here at STEM Friday, but that doesn’t mean a good fiction picture book can’t be used to promote STEM. 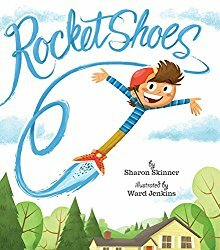 Take Rocket Shoes by Sharon Skinner and illustrated by Ward Jenkins. José works hard to buy a pair of special rocket shoes. They are a blast. His neighbor thinks they are too dangerous, however, and talks the mayor into banning them. When the same neighbor gets into trouble during a snow storm, will José break the rules and put on his shoes to save the day? This book has it all. It features diverse characters, text full of action verbs and catchy rhymes, just the right touch of humor, plus readers learn about conflict resolution in a lighthearted way (not at all pedantic). What more could you ask for? How about plenty of potential to tie-in STEAM activities? Check out Wrapped in Foil blog for suggestions for just a few of the many STEAM activities that could be inspired by the book. It is sure to fire up a child’s imagination. Categories: Engineering, Math, STEM Friday round-up, Technology | Tags: Rocket Shoes by Sharon Skinner | Permalink.